Philippine’s Yuka Saso has chipped in for eagle on the 18th hole at Royal Wellington Golf Club to end a stunning opening round of seven-under par at the ANNIKA Invitational Australasia while North Harbour’s Anna An is the leading Kiwi. Sitting at number 35 on the women’s amateur golf rankings, Saso’s round was even more impressive having just got off the plane from the Philippines to play the course for the very first time and carding six birdies to go with her eagle three. 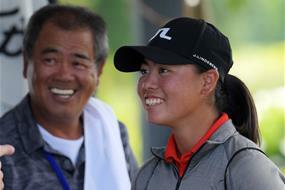 “It was really good today and I didn’t expect it to go in the hole.” Saso commented about her stunning finish. After a steady opening nine, Anna An flicked a switch early in her back nine to make three birdies on the bounce to end her day at two-under par and alone in sixth place. The New Zealand Amateur Champion, Vivian Lu also thrilled today by making five birdies in-a-row early in her opening round (holes 2-6) which gifted her the outright lead, to catch the attention of the local galleries. Lu will be ruing a tough stretch in her back nine where she followed a bogey on 12 with a double-bogey on 13 to halt her momentum and end the day six-shots behind the staring Saso from the Philippines. Her Auckland Toro Interprovincial team mate, Miree Jung of South Korea was also in fine form after carding a round of three-under, 69 to be in contention on day one. She was unbeaten in match play last week and has continued where she left off. The inaugraul ANNIKA Invitational Australasia has got off the great start at Royal Wellington Golf Club and with the arrival of Annika Sorenstam today, this golf club is thriving. As part of the ANNIKA Foundations goal to grow the women’s game, Sorenstam is hosting a ‘More than Golf’ private seminar for the players this afternoon before opening things up to the media tomorrow during her golf clinic which will take place at 3:00pm for all to enjoy.